TAU Investment Management LLC, a New York-based growth-equity venture investment firm is currently in the process of raising a US$1.0 billion for modernisation of the garment and textiles industries in Bangladesh, Indonesia, Cambodia, Vietnam China and, to lesser extend, in Turkey. The fund is backed by the Soros family, Yahoo co-founder Jerry Yang and the Global Emerging Markets group (GEM), which describes itself as alternative investment group focused on emerging markets. The fund aims to invest up to US$200 million or 20 per cent of the total global fund in minority stakes in a few bigger hyper-compliant factories in the garment and textiles industries in Bangladesh. The size of individual investment will vary from US$20m to US$50m in a few garment factories that will generate over US$70-100m annual sales. Differing with the buyers, retailers, consumers and other stakeholder solutions to the current problems in the Bangladesh’s garment and textiles industries, the fund believes that businesses should try to act like capitalists, using markets and the potential of investment gains to reform their global supply chains. The fund managers are convinced that their initiative was a “capitalist solution to a capitalist problem”. After the world’s deadliest industrial disaster since Bhopal (India) tragedy of 1984, the garment factory complex collapse in Bangladesh killing at least 1,133 innocent people drew global attention to Bangladesh’s poor safety record and irresponsible supply chain management of some of the world’s best known clothing brands. This historical tragic event rang the bell – in every direction from socialists to capitalists up-to the wall street. Suddenly, Bangladesh became very important destination for all of them – for various purposes – which may have pleased Bangladesh in the beginning. But unfortunately the enthusiasm about foreign dominance/control in the industry started fading out quickly as international pressure particularly that of the European Union on compliance with labour rights, in particular freedom of association and collective bargain, and occupational health and safety of the workers, mounted. Therefore, Bangladesh has no other options but to continue talking with the international communities, particularly to save the European Generalised System of Preferences (GSP) trade privileges after loosing it in the USA in June 2013. Bangladesh’s progress in implementation of the National Tripartite Plan of Action on Fire Safety and Structural Integrity (the Action Plan) for the USA and the Sustainability Compact for the EU, remained unsatisfactory to the both major destination of Bangladeshi export. The EU will have a full assessment of the Sustainability Compact’s achievements on its first anniversary in July this year. Bangladesh’s failure to live up-to it’s specific and time-bound commitment to improve levels of occupational safety and health and promote responsible business conduct and greater respect of labour rights, with a particular focus on freedom of association and the right to collective bargaining may leave the EU with no option but to take “appropriate action”, such as limitation, temporary suspension or cancellation of the GSP in order to remain credible, most importantly to their citizens across Europe. The European Union (EU) called for substantial progress on labour issues for Bangladesh’s continued Generalised System of Preferences (GSP) trade privileges. Currently, Bangladesh enjoys the GSP facilities that provide quota and duty free access to the EU member states all items from Bangladesh but arms. The world attention and related risks for Bangladesh created opportunities for all – from socialists to capitalists up-to the wall street – those who heard the bell. How far is Dhaka from the Wall-Street? Wall-street investments are heavily depended on rate of return, ratios, fundamentals and financial analysis of the target object which may work fine in developed economies and sophisticated financial markets but such level of dependency on financial reports from Bangladesh may be used very cautiously and must be validated through multiple cross-check mechanisms and sources, particularly because of the lack of accountability of the auditors, poor implementation of the laws and the experience of getting way with faulty to fraudulent accounting practices in Bangladesh. The newest addition in the system is the Credit Rating Bangladeshi style, which must be read and analysed independently and very carefully. For many entrepreneurs in Bangladesh the end goal is to get loans, ideally from one of the state-owned banks and never payback because those banks keep rescheduling as long as needed and then finally write-off as bad loans depending on who you are and who you know. Performance or capital efficiencies play secondary or lower level role in the entrepreneurial eco-systems in Bangladesh which may not be new to the wall-street investors but surely very difficult to believe and fully understand it’s magnitudes. In spite of socio-cultural risks besides classical investment risks there may be some but very limited opportunities for wall-street style investments in Bangladesh or capitalistic answer to the capitalistic problem but in wrong place. The market is just not ready although some but very slow progress are being made. 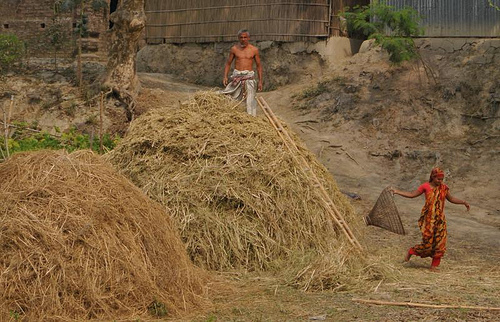 Therefore, the million dollar question is how worthy it is finding needle in a haystack in Bangladesh and what is the net rate of return on how much efforts doing things right in Bangladesh.